Thinly slice the tomato. Thinly slice the cucumber. Peel and mince just half the shallot; thinly slice the remaining half. Drain, rinse, and dry the chickpeas and add them to a large bowl. Mash some with the back of a fork and add in the minced shallot, Vegenaise, celery seeds, and a pinch of salt and pepper. Stir the chickpea tuna well. Place a large nonstick skillet over medium-high heat with 2 tsp olive oil. Once the oil is hot, scoop the chickpea tuna into two portions, about 1 cup each, and add to the skillet. Sprinkle the chickpea tuna with cheddar cheese, cover the pan, and cook until heated through and melted, about 5 to 7 minutes. In a large bowl, combine the sliced cucumber, sliced shallot, shredded green cabbage, red wine vinegar, 2 tsp olive oil, and a pinch of salt and pepper. Toss the quick pickled cabbage and cucumbers well to coat. Pop the sourdough bread in the toaster. 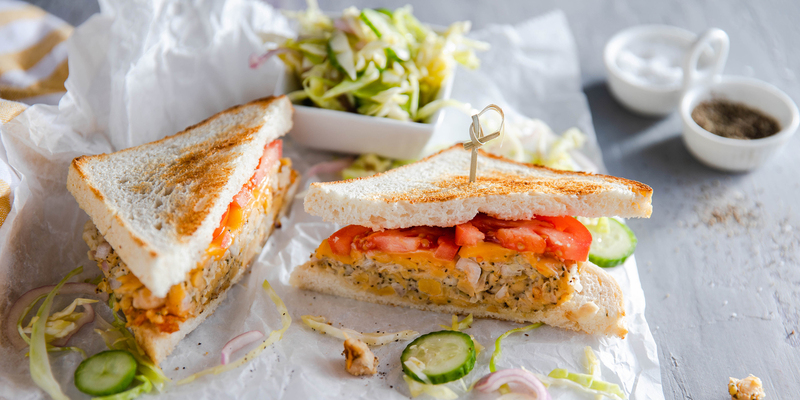 Carefully transfer the chickpea melts to the toasted bread. Top with the sliced tomatoes. Serve with pickled cabbage and cucumbers. Dig in!